17 January, 2019- Two years after first of eight launches, Iridium NEXT Constellation of 75 LEO satellites is fully deployed. Two years ago today, Iridium launched the first of a series of eight payloads containing its new Iridium NEXT constellation low-earth orbit satellites. As of last week, the entire Iridium NEXT constellation has been successfully deployed over the course of its eight launch missions using SpaceX Falcon 9 rockets. The completion of the launches means Iridium can now go live with its Certus product, a broadband service that will provide infrastructure for a number of innovative solutions in the market. GSE has been tracking all of the launches over the course of the past two years, and even attended a couple of them along the way. 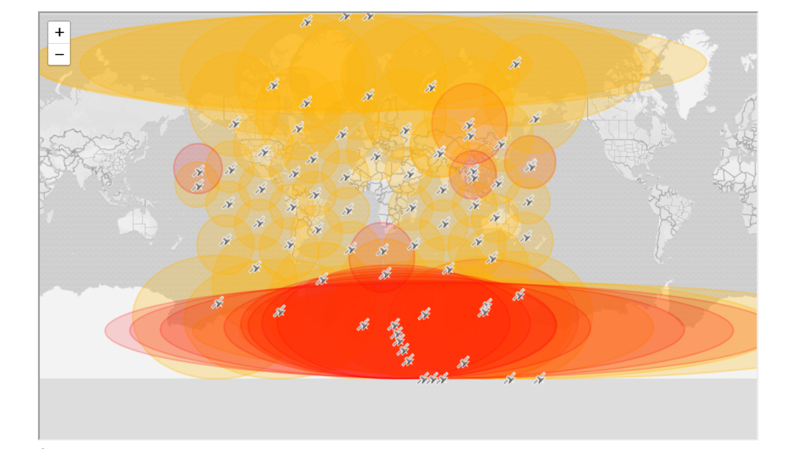 Using this live tool , anyone can view all 75 of the satellites in Iridium’s global, pole-to-pole coverage, constellation. GSE will continue to provide the service of maintaining a live tracking visualization of Iridium’s constellation, including location and status, for anyone to access at any time. For users of GSatTrack, the constellation tracker is available as a map layer that can be toggled at any time. A number of GSE products will be able to take advantage of Iridium’s NEXT constellation, GSE continues to provide custom engineering solutions using other hardware devices that also operate on the Iridium network. There are a number of excellent opportunities now available through Iridium Certus, and GSE is excited to make those innovative solutions a reality for its customers.